Joint Vitality Review – Is This Product Safe To Use? Joint vitality is marketed as a natural solution to joint nourishment. The producer claims that this dietary supplement was manufactured to strengthen and nourish the tissue surrounding your joints and at the same time offering cushion to your joint regions. According to the producer, the answer to fighting joint pain lies on addressing the root cause of the pain. The product is sold in a white bottle (with a white label) that contains 200 joint vitality capsules. What does the manufacturer say about Joint Vitality? The boldest claim that the producers make is the declaration that it took them six years and over 20 million dollars plus thousands of man hours to establish and prove that Joint Vitality drastically reduces the pain and discomfort brought about by arthritis. The producer further claims that besides using the three most common joint care ingredients, they use 27 other minerals and vitamins plus a patented ingredient called Arthred. Although they don’t reveal how it is made or what goes into it, they claim that Arthred is a combination of collagen and 50 other ingredients! The producers go ahead to claim that the effectiveness of Joint Vitality has led to doctors adopting it as the choice product for the rehabilitation of arthritis and arthritis related conditions. 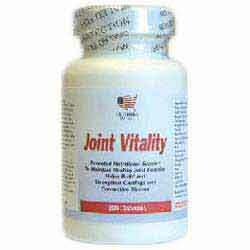 Joint Vitality is produced by a company that goes by the name Florida Direct. The product label of Joint Vitality features a United States flag and map but the official website gives the physical address as P.O. Box 57, Zuzwil SG, 9524 Switzerland. We are not certain whether the product is produced in Europe or in America. NB: should not be confused with Joint Vitality by Pure vitality (New Zealand based company). What Ingredients are in Joint Vitality? How Effective is Joint Vitality? According to a text on the official website, Florida Direct has spent $20 million and thousands of man hours (spread across six years) to prove that this product is effective in easing the pains of arthritis. Nonetheless, they are careful to not clarify whether it was through lab research or a clinical trial. They have neither explained how the “thousands of man hours” or the “$20 million” was spent. From where we stand, we can only judge the effectiveness of the joint vitality based on the information we know; the research done on the three mentioned ingredients and the customer feedback. Research on the individual ingredients (MSM, glucosamine and chondroitin) suggest that the three of them combined can cushion joints, promote stronger connective tissues and repair worn out or damaged cartilage. Customers who are using this product are divided on its effectiveness with some describing it as “ineffective” and “complete waste of time”. The customers in support love it for the “unknown”. They believe the patent ingredient is the key to its effectiveness. Too many ingredients increase the risk of allergies. The producers have taken a huge gamble by claiming that the product has over 70 ingredients yet they list only three ingredients. This move may scare customers with known allergies for fear of the unknown. Nevertheless, the three listed ingredients are quite decent in joint care and have been used for a long time. If you have known allergies, we recommend that you continue reading some of our reviews for information on better products.